Farer Thread’s embroidery thread materials are used for making high quality embroidery products. Yarns are the materials of excellent thread twisting plant; raw white (grey) trilobal polyester is processed in dyeing plant with dye cone package; finished thread used for computerized embroidery machines and schiffli embroidery machines. -- Polyester yarn, shiny (bright) continuous filament for 100% trilobal polyester embroidery thread. 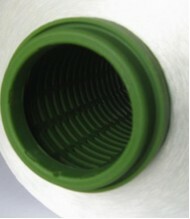 Raw white twisted trilobal polyester embroidery thread with perforated plastic dye tube pack, for cone dyeing. It is twisted from medium tenacity low shrinkage trilobal polyester filament yarn. It is an ideal material for top embroidery thread and good solutions for dye units. -- Products: Raw white (grey) 100% continuous filament polyester trilobal embroidery thread with dye tube. 1. Low shrinkage, high tenacity. 2. Very stable yarn specifications performance. 4. Free of quality defects, is sourced from professional production and strict quality control. It is top embroidery thread in world. -- Net weight: 1000g/dye cone. 100% trilobal polyester embroidery thread. 100% viscose rayon embroidery thread.